Necessity is the mother of invention, of course, and some of the best things in the world have come about because someone was frustrated enough with the current choices to come up with an alternative. Such is the case with the SpaceCamper, the innovative van/camper/transporter that is miles away from its closest comparable vehicles. It was designed by German designer/entrepreneur Markus Riese, who had already found success early in life when he founded bike manufacturer Riese and Muller while still at school. Following graduation, Riese decided to spend a year traveling around Australia – and that’s when inspiration struck. Riese traveled Australia in a campervan, and if you’ve ever spent a summer vacation riding in a camper, you know how awful the experience can sometimes be. He kept notes on everything that he wished his campervan could do as well as complaints and suggestions from other campervan travelers. In the end, the idea for the SpaceCamper developed. Riese knew that he wanted his campervan to be expandable, customizable, big enough for 5 people yet small enough to fit on tiny European roads and into low-ceiling carparks. 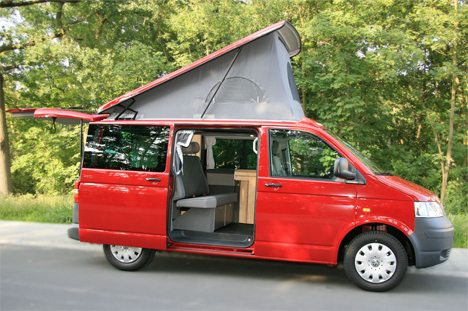 The original SpaceCamper (called “The Classic”) seats five adults, has an astonishing amount of storage space, and features front seats that can swivel around to access the dining area. Two adults and two children can sleep comfortably on the fold-out mattresses, and there’s even an option for a pop-up tent-like sleeping area. Every inch of interior space is used efficiently, and unlike many other camper choices, reconfiguring the SpaceCamper to fit your needs is actually very easy. 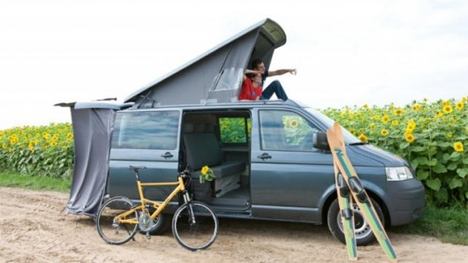 Also unlike most other campervans, the SpaceCamper is small – no bigger than a standard American van – aerodynamic, and relatively fuel efficient. It’s much easier to maneuver around the urban European environment which often features roads that are terrifyingly narrow. And there’s even the option to buy a Riese and Muller folding bike along with your SpaceCamper. Although it’s not yet available outside of Germany, the SpaceCamper may soon be offered in other countries. It seems safe to say that this awesome vehicle could very well change the way families do vacations. See more in Cars & Trucks or under Transportation. November, 2009.